The western rim of Mars' Endeavour Crater, as seen by NASA's Opportunity rover. NASA's Opportunity rover has now been on Mars for 15 years, but the milestone is a bittersweet one. Spirit finally went silent in March 2010. After getting bogged down in thick sand, the rover lost the ability to orient itself to catch the winter sun and ended up freezing to death, NASA officials have said. Opportunity may have recently met a similar fate: It hasn't made a peep since June 10, 2018. A monster dust storm boiled up around the six-wheeled robot's locale, the rim of the 14-mile-wide (22 kilometers) Endeavour Crater, in late May. The storm grew into a global event and raged for several months, preventing Opportunity from getting the sunlight it needed to recharge its batteries. As a result, "Opportunity likely experienced a low-power fault, a mission clock fault and an up-loss timer fault," mission team members wrote in an update earlier this month. Opportunity's handlers have been trying to rouse the rover for months, as part of an "active listening" campaign that's scheduled to run through at least the end of the month. It's now the windy season around Endeavour Crater, and the hope is that stiff breezes will blast some dust off Oppy's solar panels and allow the rover to recharge its batteries at long last. "We are doing everything in our power to communicate with Opportunity, but as time goes on, the probability of a successful contact with the rover continues to diminish," Callas said. So keep your fingers crossed for Opportunity, and send some positive thoughts to the rover and the mission team on this anniversary day. Maybe Oppy — which has traveled farther on the surface of another world than any other vehicle — will bounce back, supremely well-rested and ready to roam once again. NASA still has one active rover on the Red Planet — the 1-ton Curiosity, which has been exploring the interior of the 96-mile-wide (154 km) Gale Crater since August 2012. 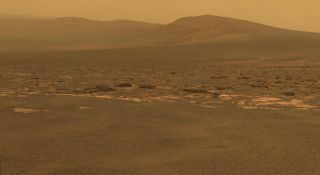 Curiosity is nuclear-powered and was therefore pretty much unaffected by last year's dust storm. And a few more wheeled robots will touch down on Mars a few years from now, if all goes according to plan. NASA, the European Space Agency (in partnership with Russia) and China all aim to launch Mars rovers in mid-2020. The NASA and ESA missions will hunt for signs of past life on the Red Planet.